On February 5, 1981, the Toronto police initiated “Operation Soap” – the code name for brutal police raids on several of Toronto’s gay bathhouses. In the largest mass arrest since the October Crisis, 286 men were arrested and charged as found-ins, and twenty men are charged as keepers of bawdy houses. In subsequent trials, all but one of the “found-ins” were acquitted (CBC Archives). The following evening, over 3000 members and supporters of Toronto’s gay community united to demonstrate against these raids. A second protest was held on Feb. 20 at Queen’s Park, with over 4000 people gathering to call for increased rights and protection for gays and lesbians in Canada. In the aftermath of the raids, the Toronto City Council commissioned an investigation into community relations between the police and the gay community. The report recommended a permanent dialogue committee between the two groups (CBC Archives). 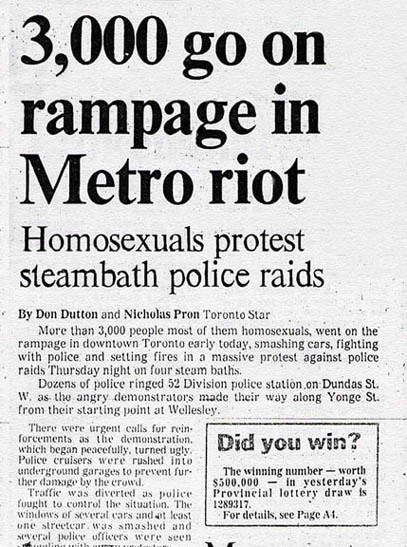 This headline from the Toronto Star, calling the protest a “rampage” or “riot” shows the media’s bias against the protesters.